A Two-Day Workshop in Tampa, FL. All dog sport success is reliant on being able to teach a dog focus, commitment and the ‘can do’ attitude. However, not all dogs or breeds benefit from this behavior and it then becomes our responsibility and role to help develop it. In this two day workshop, you will learn you how to create these behaviors and attitudes in ANY dog. Get the skills and knowledge to reward your dog effectively so your training becomes more efficient and timely. In two days, you can learn the skills to create and reinforce the best and most appropriate behaviors to meet your dog sport goals. This workshop will cover the important and necessary key skills to train a dog for any discipline whether you are training a set of weaves, or heel work, bite work or retrieving, having a dog that can learn each exercise in the shortest time is reliant on the key skills Kamal will cover during the workshop. This seminar will cover the skills needed to do just that….. Duration, proofing and attitude training…. This seminar is for anyone that has young or ‘green’ dogs wanting to start as they mean to go on, or established dogs that want to enhance their skills! 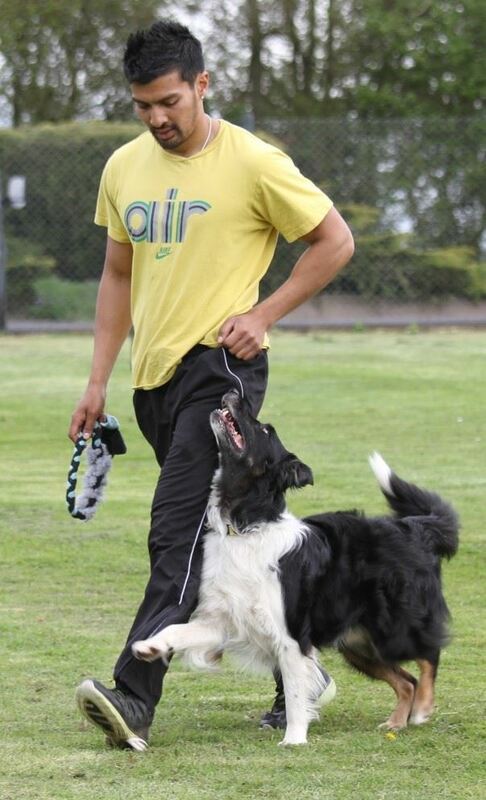 Head trainer and owner of East London Dog Training, Kamal Fernandez, has over 20 years experience training dogs from all walks of life. His current dogs include two Belgian Malinois, two Border Collies , a German Spitz and a Boxer. His own dog training journey began in the very hall in which he now runs his own classes. Kamal is also a faculty member at the Academy. As an internationally renowned seminar instructor, Kamal has been invited to teach in countries such as Australia, New Zealand, Holland, Belgium and Germany, amongst many others. Kamal’s other career highlights include being an Championship Obedience judge and Crufts competitor. Since this humble start, Kamal has immersed himself in the world of animal training, led by some of the leading ‘lights’ in the field such as Sylvia Bishop, Susan Garrett, Bob Bailey, Ian Dunbar and Karen Pryor. This thirst for knowledge combined with his job as a police officer, working with young offenders and studying psychology has contributed to his dynamic and innovative teaching style and his ability to get the best from his pupils, be they human or canine! With over 25 years of practical dog training experience, based on a combination of science and hands on experience, Kamal has established a reputation for positive training and has championed the use of reward based methods all over the world. TV appearances on BBC 1, 2, channel 4 and 5. Monthly financing available. Complete payment must be received 30 days prior to the event. There will be an onsite Bonfire ‘Get Together’ on Saturday Evening. A small additional fee will be charged for snacks and refreshments if you choose to attend, ($15.00). Reservations can be made closer to the date. You can make several payments for this workshop by contacting Rebekah King. All dogs attending must be dressed according to the PPG’s Guiding Principles. No shock, choke or prong collars. No human- or dog-reactive dogs please. Please bring with you a mat for your dog to rest on, a Kong or other mentally stimulating toy and lots of small yummy treats. Sponsored & Hosted at The DogSmith Training Center.